Anyone else feel like we should be farther into the week than Tuesday? Boy do I feel that way! It's finally cold again in Greenville and while I adore when the temperature actually matches the season it has me going from the inside of one building to the inside of another to stay warm. While I have a closet full of warm sweaters and boots to stay warm on chilly days it is oh so easy to fall into the rut of leggings and layers of jackets. So with leggings we have casual covered and with sweaters and jeans we have a little nicer covered too but what's a girl to wear when it's cold and you need to look a little bit nicer? This is what I ask myself pretty much every time I stand in front of my closet while getting ready to go and student teach. While I would like to say I know what I am going to wear days in advance and it doesn't look too teacher-y that isn't always the case. I have found over time that the absolute easiest piece to throw on before I head out the door by 6:20 (yep, that's a 5:30 wake up time) is a dress of some sort. An entire outfit in one article of clothing? SOLD. The trick for me lately has been finding relatively simple dresses with a fun twist that could be worn countless times before someone realized that I wore this last Thursday too... Another factor to account for would be warmth, at least in the winter. 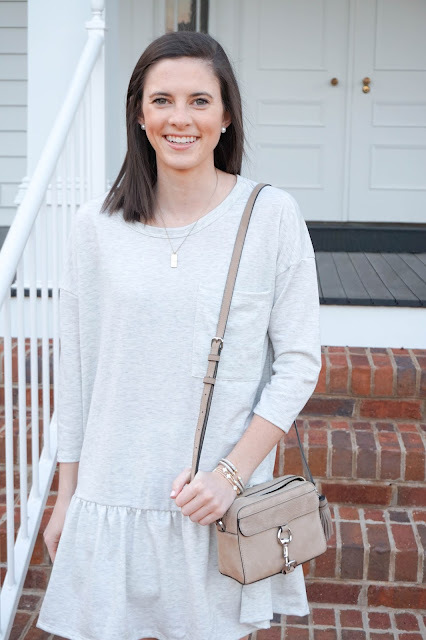 When I saw this dress I knew it needed to make its way to my closet as both the perfect teacher dress and piece to throw on when I want to look a little nicer with very little effort. 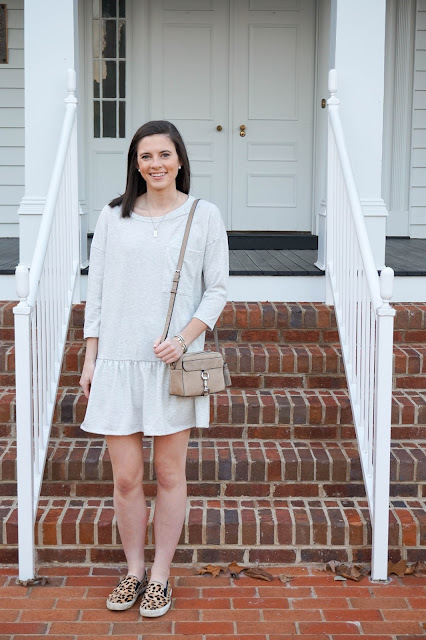 It's made of a sweatshirt material that is so soft and the drop waist hem that this dress has become a common reoccurrence in my closet! Typically when I go to student teach I'll wear nicer shoes but for more casual days when I wear this dress I love a good pair of slip ons and this leopard pair has seen its wear over the years! From roaming the streets of Paris to Alabama and South Carolina I'm surprised by how well they've held up! 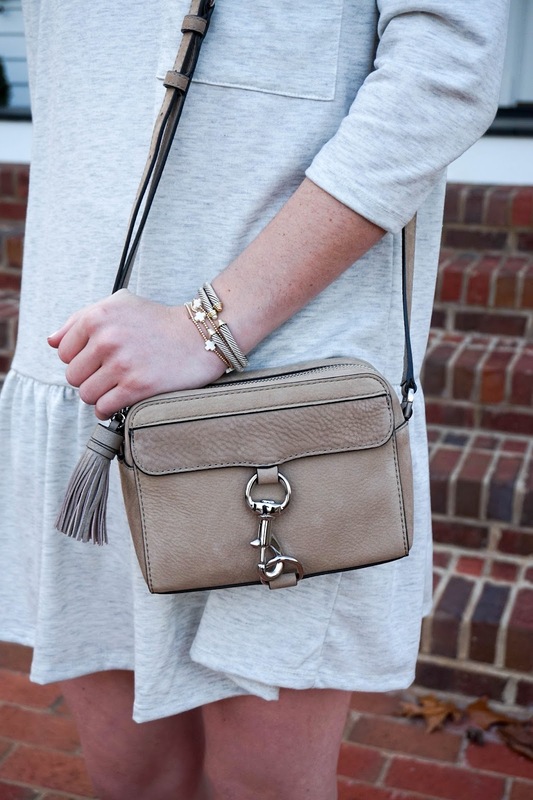 This cross body is also one of those pieces that I know will become a staple in my closet too! Do y'all have go-to dresses like this? If your favorites are still in stock leave them below, the more the merrier! Dorothy, you rock this outfit so well! I love the dress. The pocket is my favorite part. A little short for student teaching...don't you think? This dress is so cute- I love the ruffle on the end!